Getting half off most Zune accessories is cool, but getting a Zune and a Home A/V kit for just $150 is awesome. 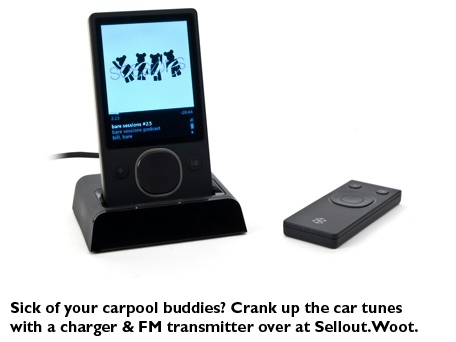 For today only (until midnight, Central time, or whenever they run out), Woot will be selling a refurbished Zune 80 and new Home/AV kit, and for just $10, they're also selling a brand-spanking-new Car Pack for just $10 (plus $5 shipping), both of which retail for several times that amount. I'm thinking of picking up an FM Kit just because they're that useful. But on the whole, pretty cool, eh?